Most people think of "strep throat" as a relatively benign infection cured by a round of antibiotics and a few days of rest. 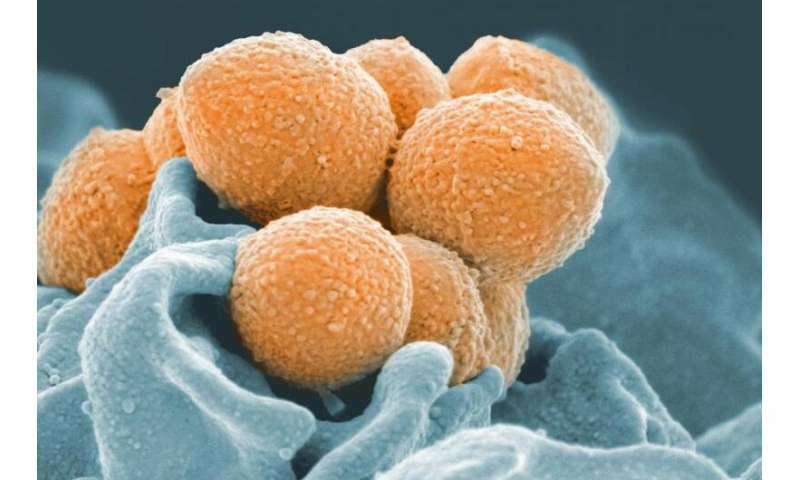 But the bacterium that causes strep throat—Group A Streptococcus—is also responsible for a number of much more dangerous disorders, including rheumatic heart disease and toxic shock syndrome. With the specter of increased resistance to antibiotics, the scientific community is feeling pressure to find new ways to treat bacteria like Group A Streptococcus. And it appears that an international group of scientists has gained some insight into this microbial enemy—and hope of a vaccine. Group A Streptococcus has a thick cell wall that protects it from environmental hazards, including attacks from our own immune system. This bacterium is remarkably resistant to the human antimicrobial protection mechanisms for reasons that are not well understood. The group of investigators—led by Natalia Korotkova of the University of Kentucky and Nina Van Sorge of Utrecht University—wondered: was there any "weak point" in the bacterial cell wall that could be exploited? The group set out to identify the genes that conferred Group A Streptococcus resistance by bombarding the bacteria with two antimicrobials: zinc ions and human group IIA secreted phospholipase A2. They found that both assays identified the same culprit: the gacH gene. The team of more than a dozen scientists from five countries, each with a discrete expertise, further deciphered the function of this gene using a variety of biochemical, analytical and structural methods, determining that it enables Group A Streptococcus to reinforce its resistance to attack by our defense systems by modifying cell wall glycopolymers with glycerol phosphate. "This previously unrecognized Streptococcus cell wall modification impacts host-pathogen interactions and might therefore be a very attractive target for vaccine design, especially since the gacH gene is widely distributed in the genomes of Group A Streptococcus and related bacteria," Korotkova said. State-of-the-art NMR methods and mass-spectrometry analyses enabled the identification of this modification. "This glycerol phosphate modification had gone unnoticed for decades due to loss during preparation steps," she said. Because the Strep A bacteria is ranked among the top ten causes of mortality from infectious diseases in the world, the potential impact of a vaccine is considerable, particularly where resources and access to healthcare are limited. "We need additional studies to demonstrate that this glycerol phosphate-modified glycopolymer can be included as a component of a safe and effective Group A Streptococcus vaccine" Korotkova said. " Results were published on April 1, 2019 in Nature Chemical Biology.